Dr. Pamela Lightsey is an out queer scholar and social justice activist at Boston University School of Theology where she serves as Associate Dean of Community Life and Lifelong Learning and Clinical Assistant Professor of Theology and Practice. 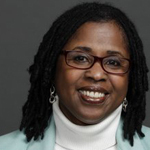 In the broader academy, Pamela serves as co-chair for the Womanist Approaches to Religion and Society Group of the American Academy of Religion. Her passion as a social justice activist and her commitment to being a servant of God’s beloved kingdom, has often found her strangely at odds with both the church and our American government. In preparation for General Conference 2012, she co-wrote, with Gil Caldwell, “An Endorsement Against Bigotry and The Injustice of ¶ 304.3.” This document signed by Black UMC scholars strongly critiqued the church’s current policies that discriminate against LGBTQ persons. Believing that military persons ought not be made to fight in unjust wars, she has recently accepted a position on the Executive Committee for the Soul Repair Project, a study the role of moral injury in veterans. Rev. Lightsey is an ordained elder in the Northern Illinois Conference of the United Methodist Church. As pastor, rather than perpetuate an elitist ethos among Black bourgeoisie in the church, she turned her attention instead to doing ministry with impoverished children and youth on the south side of Chicago. In recognition for her work she was given the United Methodist Denman Award for Evangelism. Rev. Josh Noblitt is the Minister of Social Justice at Saint Mark United Methodist Church in Atlanta, a Licensed Marriage and Family Therapist, and a Registered Neutral/Civil Mediator in the state of Georgia. In addition to offering individual, couples, family and group therapy, his ministry involves leading program, advocacy and volunteer opportunities related to social justice issues in the community. Rev. Noblitt completed his Master of Divinity at Emory University in 2004 and was ordained at the Western North Carolina Annual Conference of the United Methodist Church in 2009. Rev. Noblitt is a Clinical Fellow with the American Association of Marriage and Family Therapy, has served on the Board of Directors for the Reconciling Ministry Network since 2008, is a member of the Emory University Hope Clinic for HIV/AIDS Research Community Advisory Board, serves as Vice President of the South Atlanta Civic League, and is a 2011 LEAD Atlanta alumnus. WORSHIP LEADERS: DeLyn and Sarah Celec will lead us in daily worship as we remember and celebrate the faith traditions and relationships that impel and sustain us on our justice journeys. The Rev. DeLyn Celec is the Campus Minister of Worship Arts at Shenandoah University in Winchester, Virginia. She is ordained through the Church Within A Church Movement and earned her Master of Divinity degree from Drew Theological School. Her passion for social justice is evident in her music and writing. As a worship leader for various events, she is grateful to include people of diverse backgrounds and skills in leadership and other participation in corporate worship. She has a deep desire to contextualize old and new traditions from around the world in musical and worshipful settings. DeLyn was introduced to the Reconciling Ministries Network in 2000; this event included her first experience meeting anyone who was both proudly LGBTQ and proudly Christian. Since then, she was called to music ministry, seminary, campus ministry and, most recently, ordination. DeLyn has been honored to sojourn with United Methodist organizations such as the United Methodist Women, the General Board of Global Ministries and the General Board of Higher Education and Ministry. She is also proud to have worked in ecumenical movements such as the World Student Christian Federation and interfaith organizations such as Interfaith Youth Core. Sarah Celec brings her background as a photographer, actor and director, and religious studies student to her liturgical art. She has recently returned to school to study Religion and Entrepreneurship at Shenandoah University, at which she is a worship artist in the University Chapel program. As a member of the Church Within A Church Movement, she is passionate about focusing on social justice in corporate worship. She has worked inside and outside of the Movement as a worship artist, also partnering with organizations such as the General Board of Global Ministries of the United Methodist Church. Sarah is a graduate of The American Musical and Dramatic Academy in New York City and enjoys acting and directing in professional and community theatre. She has brought her theatre background to the liturgical pieces she writes and directs. As a professional photographer, it is Sarah’s goal to use both her eye and her photography to bring corporate worship spaces to vibrant life. She deeply values relationship, which is visible in the way she preserves the memories of people encountering the most significant moments of their lives. Similar to her unique way of relating diverse skills of many fields to one another, she looks forward to building relationships with RMN participants as we all worship together! When Sarah and DeLyn Celec have the joy of working together, each aims to bring her strengths to the table while helping the other in areas of weakness. Their result is that the skills of each complement those of the other for a holistic, multi-dimensional worship celebration. They are passionate about using art to build community; they enjoy teaching, and learning from, artists of many types in many settings. BIBLE STUDY LEADER: Provocative, engaging and humorous Bible study sessions will be led each day by performance artist and biblical student Peterson Toscano. PREACHERS: Daily worship will be enlivened and punctuated by impassioned proclamations of God’s Word for our day by Marcus Briggs-Cloud, Karen Oliveto and Joseph Tolton. Rev. Dr. Cheryl B. Anderson is Professor of Old Testament at Garrett-Evangelical Theological Seminary in Evanston, Illinois. She joined the faculty there after completing her doctoral work at Vanderbilt University in 2000. Earlier in her career, Prof. Anderson was a practicing attorney with the federal government in Washington, D.C. Prof. Anderson is also an ordained elder in The United Methodist Church (Baltimore-Washington Conference). She is the author of Women, Ideology, and Violence: Critical Theory and the Construction of Gender in the Book of the Covenant and the Deuteronomic Law (T & T Clark, 2004). Her newest book, Ancient Laws and Contemporary Controversies: The Need for Inclusive Biblical Interpretation, was published in the fall of 2009 by Oxford University Press. Her current research interests involve contextual and liberationist readings of Scripture in the age of HIV and AIDS. She serves as an active member of the Society of Biblical Literature, her discipline’s professional guild, and she is a member of the society’s Council and she chairs its Nominating Committee. Marcus Briggs-Cloud of the Maskoke Nation is a son of the Wind Clan people and grandson of the Bird Clan people. He belongs to Talvhassee Wvkokiye ceremonial ground and is a member of the Oklahoma Indian Missionary Conference of The United Methodist Church. Marcus is the partner to Tawna Little, a Kialegee person of the Maskoke Nation who is of the Skunk clan people. A scholar, activist and musician, Marcus has served on various boards and committees that seek to protect the rights of Indigenous Peoples, including the NGO Cultural Survival, the U.S. Ecumenical Association of Third World Theologiansand theAmerican Indian Boarding School Healing Project. Marcus has served as an Indigenous spokesperson at the United Nations and is currently one of five plaintiffs for the case Blackhorse vs. Profootball to terminate the Washington Pro-Football team mascot. He has been invited to present academic lectures and musical performances in 16 countries around the world. Marcus is a former instructor of Maskoke Language in the Anthropology Department at the University of Oklahoma. He is passionate about his work with urban Native youth who produced a 17-minute, three-time award-winning documentary, entitled When It’s Gone It’s Gone, examining Indigenous language loss and revitalization through the eyes of elders. In 2011 his musical album Pum Vculvke Vrakkuecetv (To Honor Our Elders), was nominated for two awards at the Native American Music Awards. The album is a compilation of traditional Maskoke hymns with contemporary genres of worship with piano, violin, djembe with Maskoke lyrics. Marcus holds a master’s degree in Theological Studies from Harvard University where he concentrated on the dialectical intersections of liberation theology, linguistics, post-coloniality and gender theory. The Rev. Vicki Flippin is the Pastor of Social Justice, Exploring Faith, and Inter-generational Ministries at The Church of the Village, a progressive, multi-racial, and Reconciling United Methodist Church in Manhattan, New York City. A graduate of Yale Divinity School (’08) and the University of Chicago (’05), Flippin has served previously as senior pastor at Diamond Hill UMC in Connecticut, which joined the Reconciling movement during her tenure. She currently serves in leadership roles in the New York Annual Conference’s Commission on Religion and Race and Methodists in New Directions, working for both racial and LGBT equality with equal fervor. A proud signer and clergy recruiter for her conference’s Covenant of Conscience, she is committed to the practice of marriage equality in the UMC. Flippin has close family and church ties to both Taiwan and the American Midwest and currently enjoys life in New York City with her husband and two eccentric cats. The Rev. Dr. Karen Oliveto is the senior pastor of Glide Memorial United Methodist Church in San Francisco. Prior to that she was the long-time pastor of another Reconciling Congregation in San Francisco, Bethany UMC. A scholar/activist pastor, Oliveto has been a long-time leader in the Reconciling Ministries Network, having served on the board of directors and as the chair of the board. She is an adjunct professor of United Methodist Studies at Pacific School of Religion as well as adjunct professor in Drew University’s Doctor of Ministry program. Oliveto is the co-author of Talking About Homosexuality: A Congregational Resource (Pilgrim Press). Pastor Joseph Tolton enjoys a three-faceted career serving the LGBT community as a voice for spiritual freedom, social justice and economic empowerment. As a professional man of faith, Pastor Tolton is the National Minister of Global Justice for The Fellowship of Affirming Ministries (TFAM) and the Associate Pastor for Social Justice for Rivers at Rehoboth Church in Harlem. His ministry provides leadership to TFAM’s justice initiatives outside of the United States. As a public advocate, Elder Tolton serves as the Director of Africa Affairs for The Global Justice Institute. In this capacity, Pastor provides pastoral care and strategic consulting services for several LGBT advocacy groups in Uganda, Rwanda, Kenya, Cote d’Ivoire and Liberia. As an entrepreneur, Joseph is the Managing Director of Blur Communications. Since its inception in 2001, Blur, a full-service brand development and advocacy marketing firm, has been engaged by clients such as The Fashion Institute of Technology, The Turks & Caicos Board of Tourism, Hewlett-Packard, The Episcopal Church, The Vera Institute of Justice, CW Financial, ESSENCE Magazine, and Carver Federal Savings Bank. Pastor Tolton received his BA degree in religion from Vassar College and his MBA degree in management from Columbia Business School.